I wonder how much smartphone//tablet/tv/cpu/ Netflix/hulu/youtube time that I amass per week. Even with only having a smartphone/laptop and youtube [I’ve recently canceled Netflix, and amazon prime has gotten the boot too! ], its way more than I want to admit to myself. But the author brings up a salient point, “a consequence of the effort to escape it all is that people are also tuning out the Word of God. Unfortunately, going to church is falling off the table”. 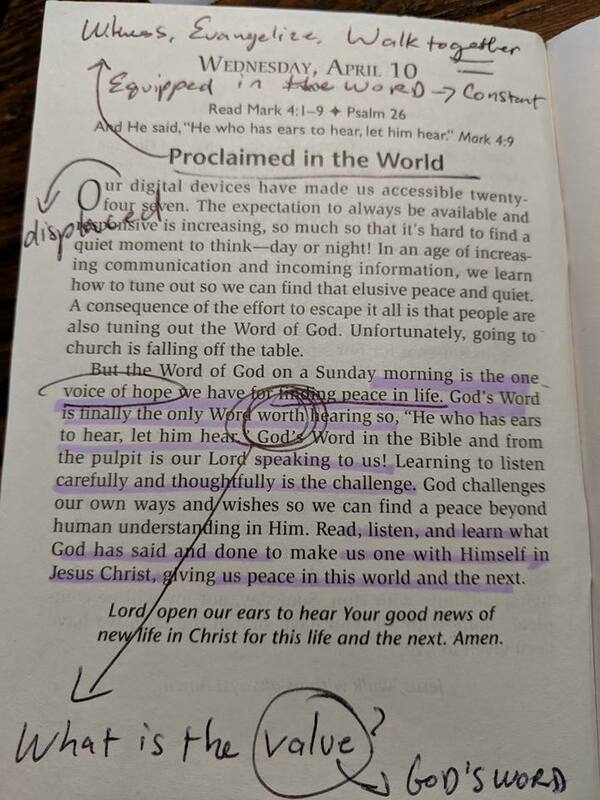 These technological advances are another way in which we are tuning out the Word of God. Even our children, who have never lived a life before the age of internet, are constantly bombarded by the need of ever changing images. Swipe after swipe, they are immersed into the life of devices, that hearing and listening has become a lost art. And even for ourselves, how quickly we tune out, and seek out our devices rather than the Word of God. Honestly, if we compare reading the Word and our device time in one week, it would be humbling evaluation. As we read Mark 4:1-9, the parable of the Sower, we are reminded that the Word of God, “faith comes by hearing, hearing the Word of God”, is crucial…more than crucial..it is our source of being. As we live in this fast-paced chaotic life that demands so much of us, we retreat to His Word, every Sunday, because “God’s Word is finally the only Word worth hearing so, He who has ears to hear, let him hear”. Come to church, Sunday after Sunday. Yes, life is busy, I know. I really do. But through all the busyness, we see the birds [Mk4:4], we see the rocky ground [Mk4:5], we see the scorching sun [Mk4:6], even thorns [Mk4:7], yes, the dangers of being out of God’s Word. It’s all to real, and though we convince ourselves, “I’m fine, what’s one week off. I’m good, what’s two week’s off”, I’ve been there. You’ve been there, we know what becomes of this. So, come to church, come to bible study [I encourage all of you to come to bible study, a vital time where we learn, and grow together/fellowship/unite in His word], because what we receive [keyword:receive-God’s gifting to us the very gifts of forgiveness life and salvation through Word and Sacrament], we are renewed and strengthened. And thus through our strengthened faith by His Word, we go, equipped, set free, as our vocations take upon a new light. A light of great joy as we love and serve our neighbor and proclaim this Word to all the World. It all begins and ends in the Word. For it is by this very Word that we grow [Mk4:8], and by the power of the Holy Spirit, we are the witnesses of the greatest gift of this Gospel. Again, nothing you do, but what God continues to do through you [1Pt3:15], by His very Word that you hear, receive and are strengthened by, week after week. “For in Him, we live move and have our being” Acts17:28. Also, hope that you all are able to attend tonight. Pastor Pearson will be preaching for our last midweek Lenten service!